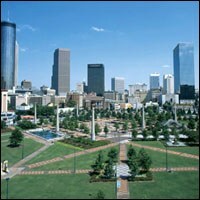 265 Centennial Olympic Park Dr.
Centennial Olympic Park boasts a variety of free, fun-filled family entertainment throughout the year, including mid-day, evening and weekend concert series, Family Fun Days, a spectacular Fourth of July Celebration, a Holiday in Lights festival complete with an ice skating rink, unforgettable fountain shows, and much more! Parking: More than 16,500 parking spaces are available in privately-owned parking lots within walking distance around the perimeter of the park. Prices vary from lot to lot. MARTA: Take the Blue or Green Line to the Dome/GWCC/Philips/CNN station, or take the Red Line to Peachtree Center, and follow the signs to Centennial Olympic Park.